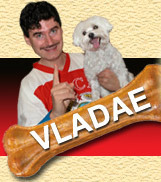 We at Arizona Saddlery are very grateful and blessed to have Vladae as our dog trainer. Our Shiba Inu's were at a critical stage of aggression towards one another. The dogs were kept on leads at seperate locations in our business thus creating high level of aggression and frustration beyond our manageability. Over a period of one year we could not take one dog near the other without the fear of a possibility of a serious injury to occur should one get loose, thus creating high levels of stress among us and our dogs.